We have observed the large supernova remnant Cygnus Loop at 34.5 MHz with the low frequency radio telescope at Gauribi-danur, India. A radio map of the region with a resolution of 26 arcmin × 40 arcmin (α × δ) is presented. The integrated flux density of the Cygnus Loop at this frequency is 1245 ± 195 Jy. The radio fluxes of different parts of the nebula at this frequency were also measured and used to construct their spectra. It is found that the spectrum of the region associated with the optical nebulosity NGC 6992/5 is not flat at low frequencies, and also exhibits a break at a frequency around 400 MHz. The spectrum of the region associated with NGC 6960 also shows a break but around 1000 MHz, while the spectrum of the region associated with NGC 6974 is straight in the entire frequency range 25 to 5000 MHz. 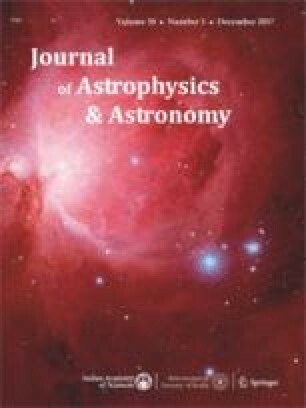 The implication of these results on the basis of existing theories of the origin of radio emission from supernova remnants is discussed.